"Good location to bars and restaurant." Have a question for Noble Night Guesthouse? 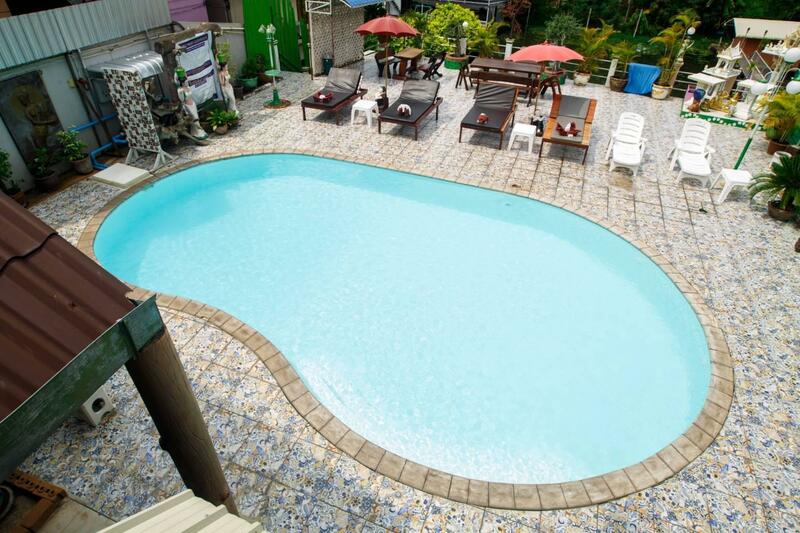 "Motorbike parking, guest friendly, great loc, pool, lounge in shade." "There is a fabulous night market at the train station." "Small hotel in nice location"
Situated in River Kwai, Noble Night Guesthouse is the perfect place to experience Kanchanaburi and its surroundings. From here, guests can enjoy easy access to all that the lively city has to offer. Visitors to the hotel can take pleasure in touring the city's top attractions: Westwonder Waterpark, Apple & Noi's Thai Cooking Course, AS Mixed Travel. 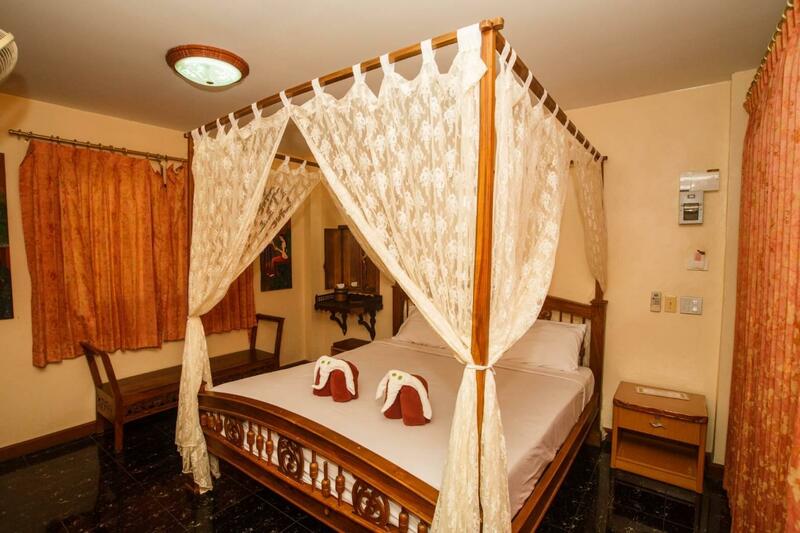 At Noble Night Guesthouse, the excellent service and superior facilities make for an unforgettable stay. To name a few of the hotel's facilities, there are free Wi-Fi in all rooms, Wi-Fi in public areas, car park, room service, family room. All guest accommodations feature thoughtful amenities to ensure an unparalleled sense of comfort. The hotel's outdoor pool, garden are ideal places to relax and unwind after a busy day. Discover an engaging blend of professional service and a wide array of features at Noble Night Guesthouse. "Great staff, great location, great rooms." Some parts of the property will be undergoing renovation from March 25, 2019 to April 30, 2019. There will be some areas affected by the noise during this time. This place is really nice. I enjoyed every minute staying. It’s in the center of the bar street, but the rooms are close to the river and therefore you can enjoy the silence and the sounds of nature. Except when one of those party boats comes by, but that is not very often. In the beautiful garden area it was totally silent. It has a little pool I never used, but yeah it’s there and clean. The rooms are basic, but actually all I need is a bed and a shower. The fridge was nice too to keep some drinks cold and yeah a TV I never switched on. All in all I was very happy here. I would always recommend it! After arriving at the hotel we realised that this was not a true 2 star hotel,more like a 4 star without the expensive price tag,we could not have been more happy as we had a room over looking the river ,the staff where so friendly and it was only a short walk to the restaurants and bars and only 5 minutes on a bike to the bridge . Stayed here many times, great value for money, great location centrally located on the river half way between main cemetery and Death Railway Museum one way and the famous Bridge over the River Kwai in other direction. Even has a small swimming pool. For the money you are paying you wont get much better. Clean, nice staff, swimming pool. yeah! next to the bridge as in it's on the same road, so you can walk if you wanted about 15mins. staff nice, breakfast was in front, at the Tara which I also stayed at which was a little better for us. Away from the noise and has a pool. this is my second stay at the noble knight. this is a good hotel for the price and it is in a good location. it is just past town, where all of the bars and restaurants are. it is close enough to walk, but far enough to be quiet at night. it also has a great swimming pool, and helpful staff. i will definetely stay there again wehn i am in kanchanaburi. Noble Night is in the middle of a tourist-oriented stretch of small hotels, restaurants, and bars, right on the river and close to the bridge but a few kilometers from the middle of town (about 10 min by taxi, or a serious walk). All of the necessities are there - scooter rental, convenience stores, and nightlife. If you're not into any of that, at least it's not in-your-face or loud - would be fine for children. 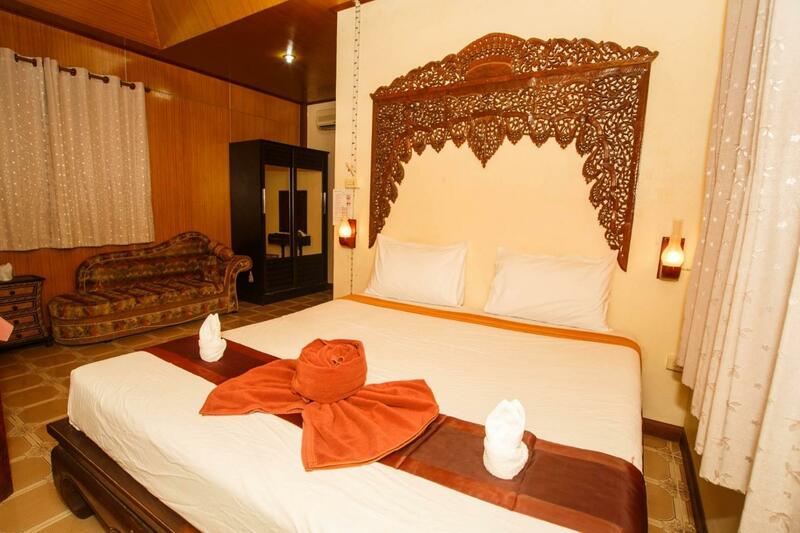 The rooms are quite nice, and are clean and well-maintained, and the common areas are nicely landscaped. There are safes in the room, and my only minor complaint is there were not many power taps. Breakfast is included at a nearby restaurant. The staff were adequate but not very professional or helpful, though they did speak English. They had overbooked and were a little surprised when I arrived, but got me into a room, and I had to move the next day. Clean room , friendly workers at guesthouse , quiet night for sleep , like this place very much and would like to stay there again next time i visit kanchanaburi , fast Laundry , close to restaurants . Ok it’s a budget place but it really feels it! The cleaner didn’t once come into my room to clean. Each day a bag of clean towels etc was left outside and that was it. The lock on the door felt very insecure, the mattress was like a hospital style mattress encased in PVC, which made the badly fitting sheets slide off at every turn. Tara BnB connected to Noble is far better! We had no water one evening and the next morning and we asked for a refund and they gave it to us. I am not sure if this happens all the time or it was a one time situation. There are things to like about The Noble Night. I've stayed here several times now. There are different categories of rooms. Mine was mid-priced, rustic but comfortable, clean, with a/c, large room safe. The small pool and bar/restaurant next to it provide a pleasant oasis in which to relax between sight-seeing. The hotel is surrounded by restaurants and bars catering for tourists, backpackers and expats, with low prices everywhere. We stayed in one of the raft rooms. It was a neat experience and would reccommend. The walls are really thin - but it didn't bother us. The bed was also quite hard - but for the price, location and experience it was worth it. The staff were extremely nice - we'd stay here again! Would have liked a welcome drink,but they were quite busy. The room was lovely no 8 overlooking the garden,it even had a four poster bed!!! Lovely pool and right next to the river with beautiful views. The staff were very helpful and lots of bars and restaurants near by. Bonus was vert quiet. We started out on in the raft rooms that were basic but clean enough and fantastic atmosphere we really liked it but for the lack of hot water and wifi. A little noisy just on the steel walkway but not too much of a problem, it's great to be on the river. However we ask if we could upgrade to a superior room overlooking the garden. we waited a day or so and then moved. It was just fab, quite and nice room with table to sit outside on shared balcony overlooking the garden….so pretty and well kept. We loved this place and met some great people. In Asia for ! month and used lots of accommodation some being 5 star but along with one other cheap place in Mallaca Noble Nights was the best. Well done! Location, value for money and peaceful. My third stay here. Rooms,quiet and comfortable. Good a/c. Safe deposit in the room. Bathroom has an open shower unit (ie a wetroom). The included breakfast is basic but adequate, including eggs and bacon if you want. Next to the swimming pool is a bar that sells really cheap beer and food during the day and is a great place to relax after you've been out and about. Right outside the hotel are more than a dozen bars and restaurants, mainly aimed at backpackers and ex-pats. All in all a great place to stay near the River Kwai bridge. We enjoyed our stay at the Noble Night Guesthouse. The rooms were nice enough, we were right next to the pool which was nice and had a view of the river. The breakfast is nice enough and all you need to get started on a trek or a day tour. The staff was helpful with everything from booking tours to getting motorbikes to giving directions, it was a good time. Have stayed here so I knew what I was getting. Excellent location for River Kwai Bridge, Kanchanaburi cemetery and Death Railway Museum. Also good location for nighttime bars and restaurants. Yes this is not a posh hotel, its a budget hotel that I consider good value for money, nice small pool and I have no complaints and will stay there again. We, my two older teenage daughters and myself, enjoyed our stay here. After an initial change of rooms...out of Raft Rooms(not very nice or clean)and into the poolside rooms then the rest of our stay was very pleasant and comfortable. The hotel staff were very pleasant and helpful.